Looking to start a WordPress blog? Great !!! In this article, you will learn everything about how to start a WordPress blog on BlueHost hosting. If you ask me, I would say Blogging is really incredible and will help you earn thousands of dollar per month from your home. 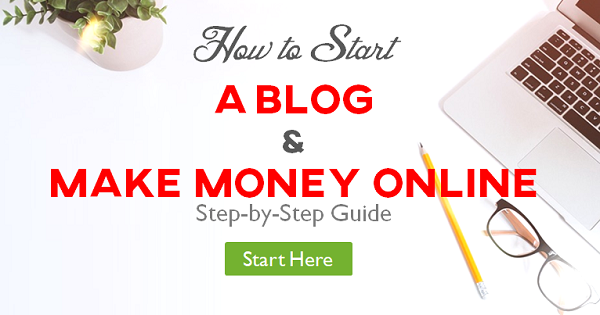 Even you can make money by creating a blog in just few dollars. To make it easy and affordable, we have partnered with BlueHost so that you can also start your own blog at a discounted price. Click here to signing up with BlueHost and start a WordPress blog with free domain name and free SSL certificate. Are you still thinking of starting a WordPress blog? Don’t think more. It’s time to act now. Use our simple step-by-step guide and launch your WordPress blog from anywhere in the world. We have a deal for you, if you sign up BlueHost through this tutorial, you’ll get a special discount on WordPress hosting at $3.95/month for 36 months, as well as a free domain name for a year and free SSL certificate! BlueHost is #1 web hosting provider and highly recommended by WordPress for more than 10 years. BlueHost offers great WordPress hosting features for starting a blog. Click here to Launch a WordPress blog on BlueHost. BlueHost has many reasons to be on the top of the WordPress hosting providers list. 2+ Million Domains Hosted: BlueHost hosts more than 2 million domain names. Free Domain Name: You’ll get a free domain name with signing up with BlueHost. This is the address of your website or blog like webhostinginsights.com. Free SSL Certificate: SSL is the most important ranking factor today with security. You can add extra layer of security with your website like (https://webhostinginsights.com). 1-Click WordPress Installer: Your WordPress installation is just a click away. You can install WordPress on BlueHost in a single click. 24/7 Support: BlueHost has improved their customer support and now you can ask questions whenever you need it. 30 Days Money Back Guarantee: If you are still not happy with BlueHost services, you can get your money refund within 30 days from the activation of your BlueHost account. Now follow step-by-step tutorial and setup your WordPress blog in just 15 minutes. 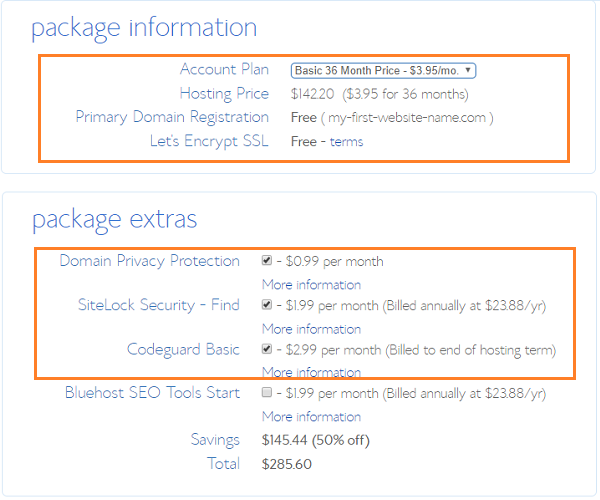 To get started, Click here to open BlueHost website and Activate the Discount. You will be redirected to BlueHost’s home page. 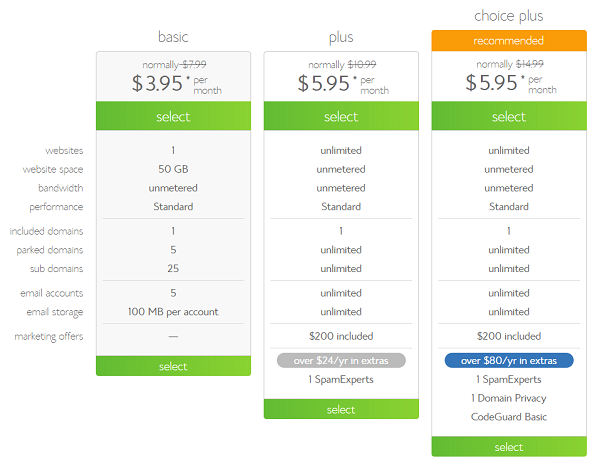 Click “Get Started Now” button and choose your web hosting plan. Note: If you are a beginner and planing to host a single website, I would recommend to choose a basic hosting plan. If you want to host multiple website, then choose plus hosting plan to start a WordPress blog. Next, you need to register a domain name for your website. Domain name is the name of your website so choose it wisely. Let me tell you why I bought WebHostingInsights.com. I dreamed to start a WordPress blog which could explain everything to my readers about web hosting, that’s why I bought this domain name. With this website, I want to give my readers the capacity to gain an accurate and deep understanding of web hosting. We are continuously working to improve the contents of this website. Write your domain name in “new domain” section and click “next”. 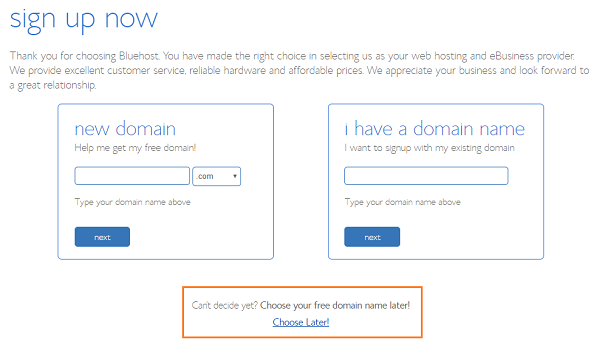 Bluehost gives you an option to decide your free domain name at later stage. You simply click “Choose Later!”. 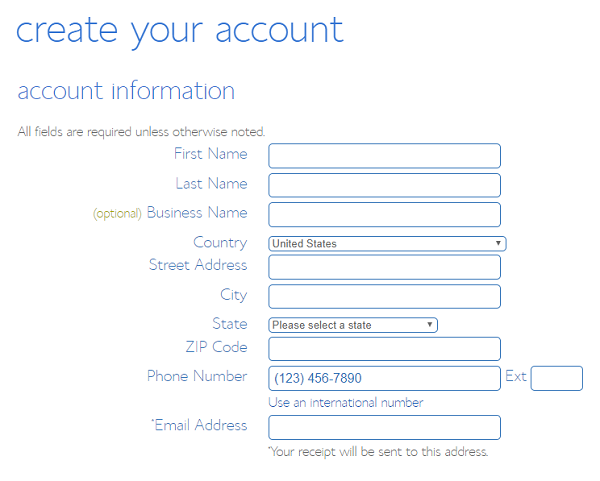 On the next page, you have to fill the account information to register your account with BlueHost. Fill this information carefully, this will be used to login to your BlueHost account. Choose package for either 24 months or 36 months to get the maximum discount. On this page, you will see bunch of additional services offered by BlueHost and some of them comes with default check option like “Domain Pivacy Protection, SiteLock Security – Find and Codeguard Basic”. If you don’t want the additional services right now, You can uncheck them. You can buy them later from BlueHost cPanel if you want. 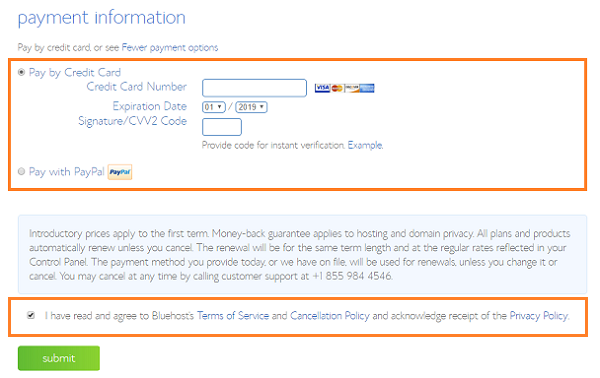 Select the BlueHost terms and conditions and make the payment to successfully signing up with BlueHost. You can choose any of the payment method either Credit Card or PayPal. Congratulations!!! Your BlueHost account is now set up. 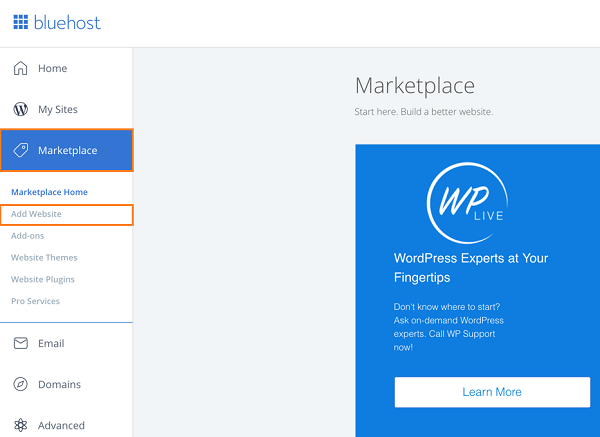 Now you can install WordPress on BlueHost and start your dream blog today. Bluehost offers a standard cPanel, which comes with Fantastico. Fantastico is one of the simplest ways to install WordPress on your website. 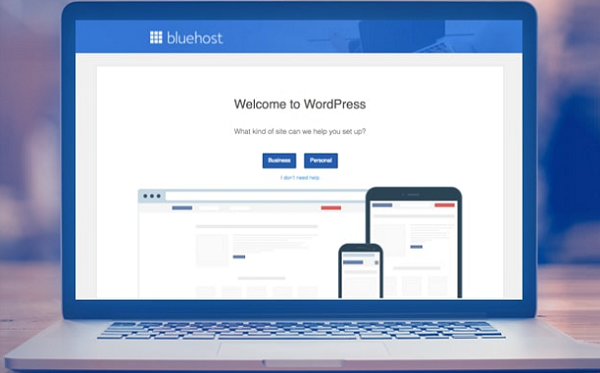 Earlier, we used to create a blog manually but nowadays Bluehost automatically install and setup WordPress on your website. How to Install #WordPress on #BlueHost in Just 5 Minutes? If you have followed above guide and purchased web hosting and free domain name from BlueHost, it will start installing WordPress automatically. You will see the below screen during WordPress installation. If you are stuck on the below screen, login to your Bluehost Dashboard. Your dashboard will look something like below snapshot. You can manage your account from here like profile, billing, products, security, add a website, install WordPress and more. Click on “Marketplace” to see the options. Now “Add Website” to create a new WordPress site. On the next screen, enter your WordPress Site Name and Site Tagline. Click on “Next” button to proceed for domain name selection. 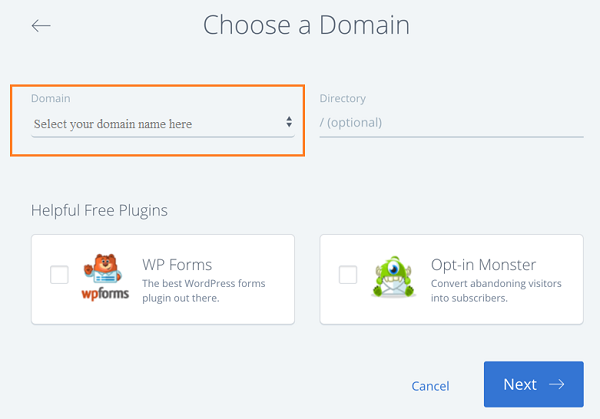 Select your domain name and click “Next” button to complete the WordPress installation on your selected domain. The installation will be completed within 5 mins. Now you can login to your WordPress website and create your first blog post. 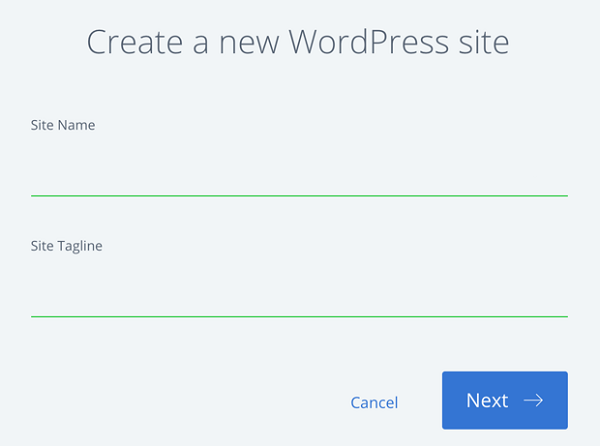 After installing WordPress on your domain name, the next step is to login to your WordPress website dashboard where you can configure your website and can create your first blog post. To access your WordPress site, open yourdomainname.com/wp-admin url and login with your user name and password. Once you successfully login to your website dashboard, it will look something like below snapshot. Next, go to Posts and click on “Add New” option to create your first blog post. Here you have to enter your post title, body of your post with rich images and hit “Publish” button to post your article on your website/blog. Congratulation!!! your first blog post is created and your blogging journey has started. Summary of How to Start a WordPress Blog on BlueHost? Now you can see how easy it was to signing up with BlueHost and start a WordPress blog on BlueHost. I hope you understood why we chose BlueHost and WordPress for starting a blog. If I sum up everything, BlueHost is the #1 web hosting provider who offers great features and best 24/7 support for WordPress users. BlueHost offers you an affordable web hosting plans with free domain name and free SSL certificate. It has been highly recommended by WordPress for more than 10 years. If you still have any confusion or query regarding how to start a blog on BlueHost, do write in comment section. We will help you to setup a WordPress blog with BlueHost. First let me congratulate you If you have registered your account with BlueHost. If you have not yet signup with Bluehost, register your account first and start your blogging journey. Share your experience with us to help other people to start their dream blog. 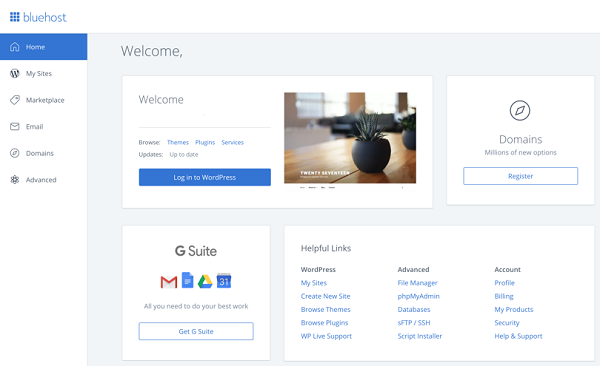 2 Responses to How to Start a WordPress Blog on BlueHost in 2019? I read your article on how to start a WordPress blog on BlueHost and BlueHost cost is huge for beginners like me. I want to start a blog but don’t want to spend too much in starting. Please suggest me how can I start a WordPress blog in less than a dollar. Hello Neeraj, BlueHost is not costly as the services and support they offer. If you still want to start a blog in less than a dollar. I would recommend you to start a blog with GoDaddy. You can checkout this link http://webhostinginsights.com/recommends/godaddy-hosting/ and you will get WordPress hosting in just $1/month.